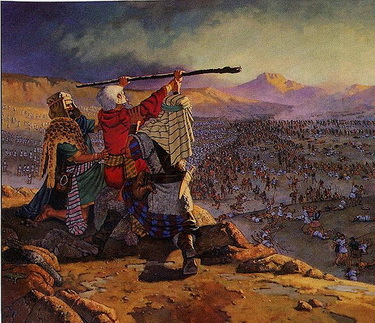 While the Israelites were staying at Rephidim, the Amalekites came up and fight with the Israelites. Joshua did what Moses told him to do. Joshua chose the strong men among them to fight with the Amalekites. Moses went up to the hill with Aaron, and Hur. When Moses held up his staff, the Israelites were winning but when Moses got tired and held down his staff, the Israelites were losing against the Amalekites. Moses was very tired and he held down his staff to rest for a while. When they saw this, they quickly take a stone and put it under Moses so that Moses can sit down. Then Aaron and Hur helped to support Moses’ hands holding the staff on both side. This way, Moses’ hands were not held down until the sun had set. Joshua and the Israelites victoriously defeated the Amalekites with swords. Moses obeyed God and he recorded it down and read it out in the hearing of Joshua. Moses built an altar to the Lord. Moses called the altar, “The-Lord-Is-My-Banner.” This is because God swore that he will have war with all generation of the Amalekites.